LONDON Paddington station has now reopened after being closed by the weather earlier today. 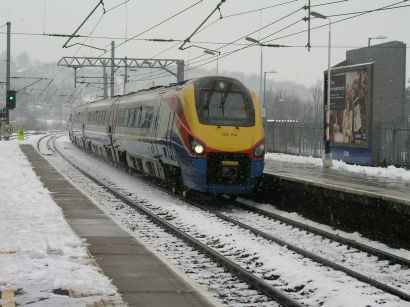 GWR and nearly all other operators are affected by the snow and winds sweeping across Britain. Services are cancelled on a number of routes, and people in south Wales are being urged to stay at home. A red warning has also been issued by the Met Office for east Devon and west Somerset. Further west, Cornwall has already been badly hit. Services on the St Ives, Newquay and Looe branches have been suspended, and many roads are all but impassable. Virgin Trains could not run north of Carlisle this morning, and ScotRail also advised passengers not to try to travel, with services suspended throughout central Scotland until midday. The south Midlands and east of England are less affected, with normal services reported by Chiltern Railways and Great Northern, although Greater Anglia has suspended services on lines to Sheringham, Great Yarmouth, Lowestoft and Felixstowe.